The Films of CCFF Screen at the Music Box Theatre in Chicago. THREE IDENTICAL STRANGERS (NOON) When three identical triplets, separated at birth, find each other in 1980 (at age 19), and it became a sensational news story. But the reunion also unlocks some secrets that go beyond their own lives, and actually could transform the understanding of human nature itself. To purchase tickets, click here. THE GUILTY (2p) This entry from Denmark involves a police offer, demoted to desk work, who gets involved in a kidnapping when it’s called to his dispatch. Confined to the station, he has to use all of his instincts – and fight his demons – to infiltrate the case. To purchase tickets, click here. SUPPORT THE GIRLS (4p). A SXSW favorite, about a Den Motherish general manager (Regina Hall) at “Double Whammies,” a sports bar of a particular genre (“with curves”). Despite her efforts, the reality of such a venue controls the course of a long, strange day. To purchase tickets, click here. ABDUCTED IN PLAIN SIGHT (6p) Special Appearance by director Skye Borgman. A “true crime” documentary about a Idaho family whose daughter is kidnapped by a neighbor. Twice. In the end, it points back toward the family. To purchase tickets, click here. EIGHTH GRADE (8:30p) Special Appearance by director Bo Burnham. It’s been a disastrous eighth grade year for 13-year-old Kayla, but she must endure the last week before heading to high school. SOLD OUT, but rush tickets could be available at the Music Box Theatre box office. 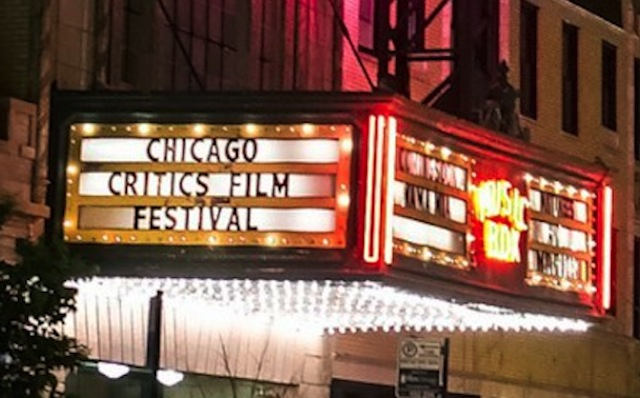 The 6th Chicago Critics Film Festival takes place through Thursday, May 10th, 2018, at the Music Box Theatre, 3733 North Southport, Chicago. For the CCFF website, click here.